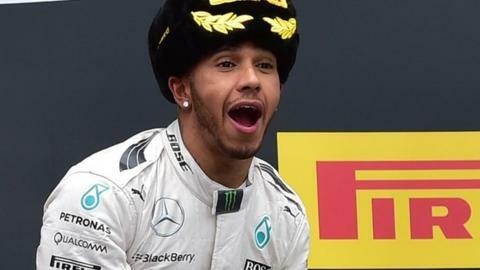 Lewis Hamilton is well on the way to winning a third world title after his victory in the Russian Grand Prix on Sunday but I have to admit I do feel for his Mercedes team-mate Nico Rosberg. Rosberg did everything right in Sochi. He took pole position, converted it into a lead at the first corner, held Hamilton off in the three corners they managed before the safety car was triggered by a crash, maintained the lead at the restart - only for the car to let him down. Had he gone on to win, it was only ever going to be a question of delaying the inevitable; Hamilton has been just that bit too good for Rosberg this year again. But it does raise the question of what part luck plays in sport; why some people appear to be lucky and some not. Hamilton has had his fair share of issues over the years. As far as I am aware, it was repeated technical problems that finally convinced him to leave McLaren in 2012, rather than some grand vision for what Mercedes would do in the future. And Rosberg had better luck than Hamilton last year. This year, though, the tables have turned and, whether it's with reliability or in wheel-to-wheel racing, Rosberg has just not seemed to get the luck. Having said that, one race does not make a championship. They are won over the course of a season, and unquestionably Hamilton has been the stronger Mercedes driver this year. Once Kimi Raikkonen received his penalty for crashing into Valtteri Bottas's Williams, Mercedes were confirmed as constructors' champions. It has been another dauntingly impressive season from Mercedes and the question is how long their dominance will continue. Right now, though, it's very difficult to assess the realistic prospects of anyone catching them up in the near future. Mercedes have a great package - the best engine and a car at least as good the best of the rest. Together that has meant they have a significant advantage over the field and what we can't know looking from the outside is how much more they have in hand, particularly in terms of engine usage. How close do they run to the limit of their engine at any point? How much of a margin do they have whereby if someone edged a little closer, they have space to push the engine a bit harder? We assume they push to the limit in qualifying and then run within a reliability margin in the races. But they have had a significant advantage over Ferrari in qualifying all year - large enough for it to be unlikely that anyone could close that gap completely over one winter, unless Mercedes make some kind of monumental mistake with next year's car. Which is not very likely. Toro Rosso's Carlos Sainz had a dramatic weekend, suffering a heavy crash in Saturday practice, spending most of the day in hospital and then racing the next day - and doing a great job, getting the car up into seventh place before he had to retire with brake failure. Those who are fond of a sick-note take note. Sainz had the uncomfortable moment of being stuck in the car. A number of things would have come into his mind - the obvious one being the possibility of fire. But thankfully he was OK. The team and the doctors sensibly went about their business of mending the car and making sure he was fit and healthy and then he went out and did a good job. It is a great example of that never-give-up attitude you see in a lot of sport. That attitude is founded on a single-minded determination to not let anything get in your way to achieve your goal which common among sports people and high achievers. There is a saying I like. A guy is asked, what are your dreams? He says dreams are what happen when you're asleep. Achieving is what you do when you're at work. There was one remark from Hamilton in his BBC interview post-race that summed up for me a lot of what I would argue F1 needs to look at as it ponders rule changes to make the sport more exciting in 2017. Hamilton said he felt in the first part of the race before Rosberg retired that he was going to be able to have a decent shot at racing him. But he added that he didn't know how hard his team-mate was pushing. That one sentence sums up some of the problems I have with where F1 is at right now. Sochi is one of the worst tracks for fuel consumption and all the drivers were having to fuel-save at various points in the race to ensure they made it to the end. There will be those who say fuel-saving has always been a part of F1, but not as we know it today. In my day, yes, you might try to save fuel to eke out an extra lap before a pit stop, but it was done for strategic advantage not to make sure you didn't run out before end of the race. This is one example of a number of bold rule statements that F1 has made in recent years that clearly tickled the fancy of someone in authority at the time, but the benefits of which for the audience are questionable at best. The quest for ultimate performance, whether it be engine power or downforce, has been lost from F1 to an extent. The tyres is another area where this applies. Unusually, tyre degradation was not an issue in Russia because the track surface puts very light loads through the rubber. That meant the drivers were able to push flat-out throughout the race, and the grand prix was much the better for it. I'm sure it's not a coincidence that there was more action in terms of crashes and racing than there often is. After all, if you're only driving at 80% or something to protect the tyres - as is normally the case - then you're much less likely to make a mistake than if you're flat out. F1 boss Bernie Ecclestone announced before the race that he had done a commercial deal for Pirelli to continue as F1's supplier until 2019. We know major rule changes are being planned for 2017, to make the cars five seconds a lap faster. But you have to question the point of making the cars so much faster if the drivers are only going to be given tyres with the same characteristics as now and not be able to drive them flat out in the races. The normal characteristic for racing tyres is that you drive them flat out and they wear to the point that there is no more rubber left and you have to stop to change it. These Pirellis are not like that. They are heat-sensitive - usually, if they are pushed hard for more than a handful of laps, they get to a temperature where the grip simply disappears. So drivers have to be conservative to eke out the ideal stint length in races. It's important to acknowledge here that Pirelli is doing what has been asked of it, and presumably it designs tyres that have different characteristics for other categories. For me, as part of the rule changes that are going to be there for 2017 - or even for next year ideally - there must be a way of having F1 tyres that encourage multiple pit stops but are not so heat-sensitive. F1 should be about the best drivers in the world driving the fastest cars as fast as they can at all times. Anything other than that is not F1 as I - and I imagine quite a lot of other people - recognise it.